Here it is! Food at Disney World. 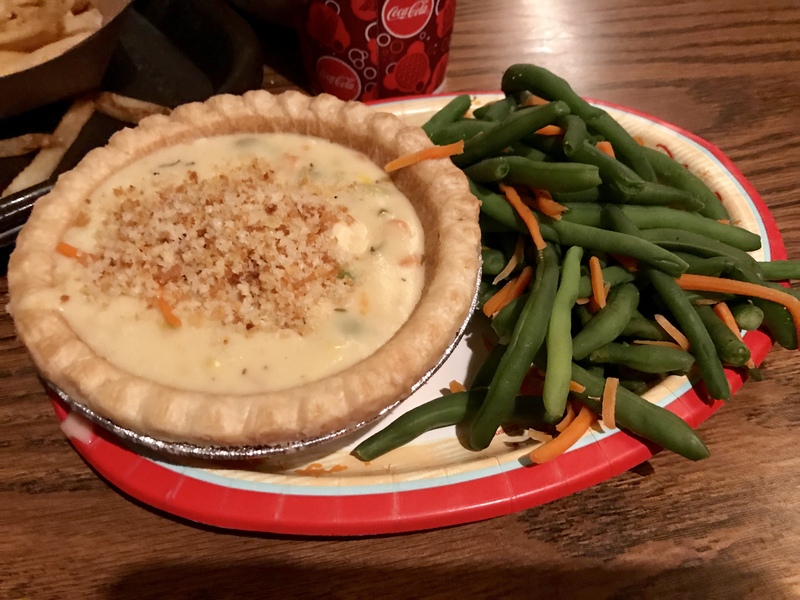 Part 2 of What to Eat at Walt Disney World. 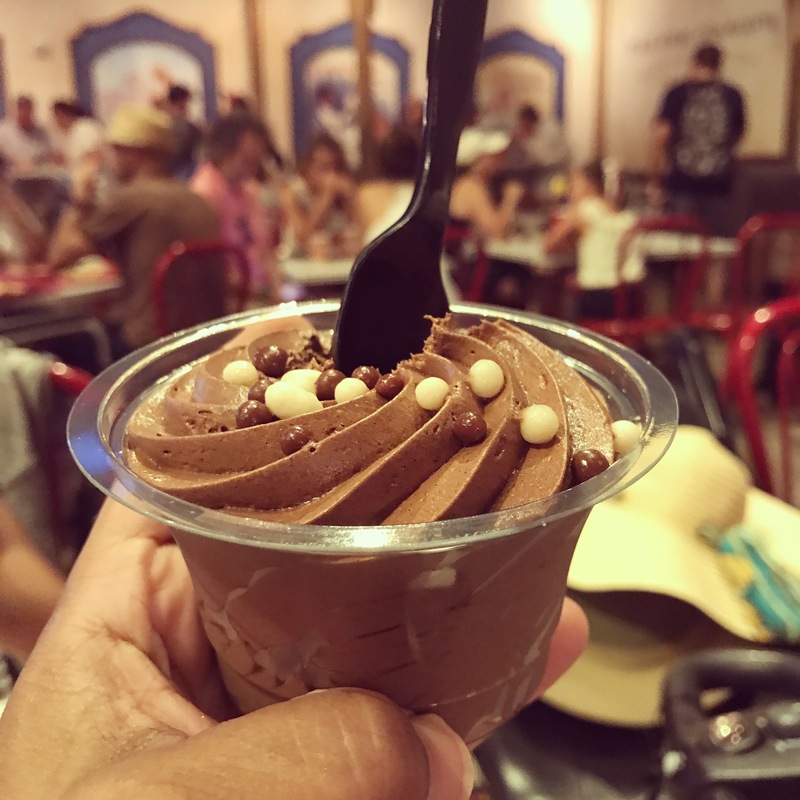 In this post I’m sharing with you just a few of the things we ate at the various parks we visited. Take a look! 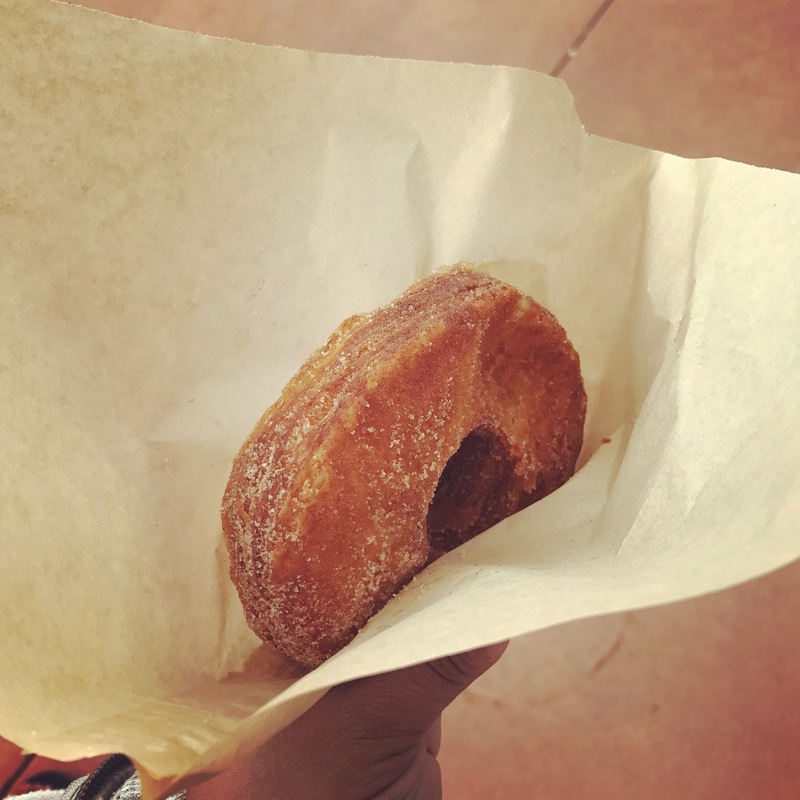 Click the following link if you missed What to Eat at Disney Part 1! When it comes to food at Disney World we visited Disney’s Hollywood Studios. We made reservations to have another character meal at Hollywood & Vine. This is a buffet style meal where characters visit your table just like at the ‘Ohana breakfast. There are Disney Jr. characters here (Handy Manny, Jake- from Jake & the Neverland Pirates, Sofia the First, and Doc Mc Stuffins). The food here is decent. It’s nothing to write home about. Although my husband, Rich, went back for seconds so perhaps it’s about what we selected at the buffet. I did however enjoy dessert (as I usually do). I selected the Mini Strawberry Cheesecake and Almond Tart. I really loved the Cheesecake. So good I went back for another. The Almond Tart was pretty good too. All of their deserts are seasonal, except for the soft serve ice cream. So when you go they may have different options. Let me know if you had anything yummy from Hollywood & Vine. Toddler Momma Tip: The food at Disney World is great for Toddlers. Book these kinds of Character meals! Its a great way to have your little one’s meet their favorite characters without waiting on long lines in the Florida heat. This way you meet characters while you eat. Time Saver! Sweet Spells is more like a bakery/sweetshop than a restaurant. Also known as the Carrot Cake Whoopie Pie. This is another sweet treat I heard great things about. Even the cast members where raving about it as I purchased it. While on line, whenever a guest would ask for recommendations, I heard them mention the Carrot Cake Cookie. Darth Vader Waffles topped with Chicken Breast Nuggets served with Maple Syrup. Yes! The chicken nuggets is basic Disney chicken. But when you throw in waffles with Darth Vader face on it and slather all of it with maple syrup… the universe rejoices. Let’s be real though. It’s not on the same level as some of the fancier meals at Walt Disney World, but it’s a good eat when you are surrounded by Star Wars rides! We totally forgot to take a picture of what we ate here. And we are sorry for it. Because it was de-li-cious!!!!! The Steak was served over Four-Cheese Macaroni with Pancetta, Aged Balsamic-Shallot Butter, and a Chianti Wine Reduction. The wine reduction… was… everything! It was the priciest thing on the menu but so we shared it and it was so worth it. I kinda wish I got my own. He ordered the steak I ordered a large salad and we split both. We were both nice and full, but it was so good I wanted more!!! 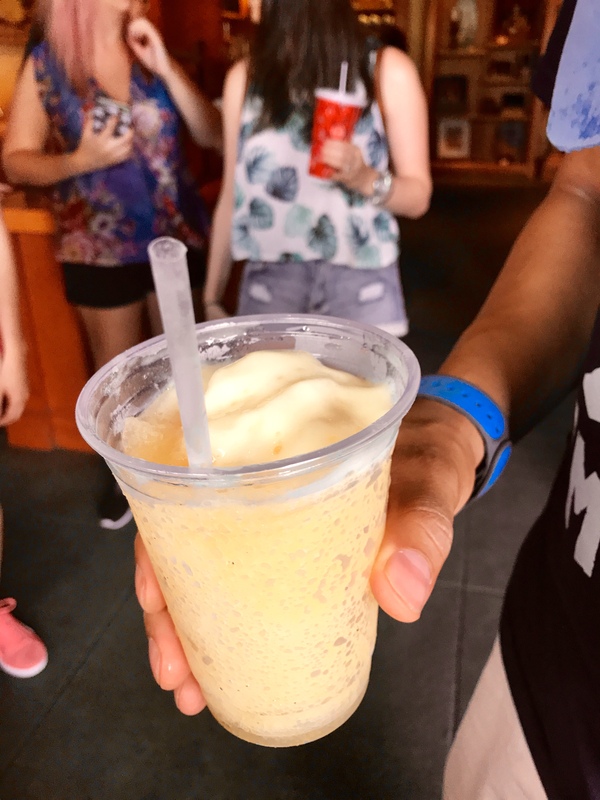 LeFou’s Brew is basically a Frozen Apple Juice with a hint of Toasted Marshmallow, topped with All-Natural Passion Fruit-Mango Foam. This was really good! Nice and surprisingly refreshing on those hot July Florida days. I thought it would be too sweet to be refreshing but no it was great! My husband developed an addiction and so we had to go out of our way to make sure we got this every time we were in Fantasyland, Magic Kingdom. I’d love to know what you think! This is just a plain old pretzel with salt on it… and a side of cheese for dipping. But there is nothing plain or old about it. 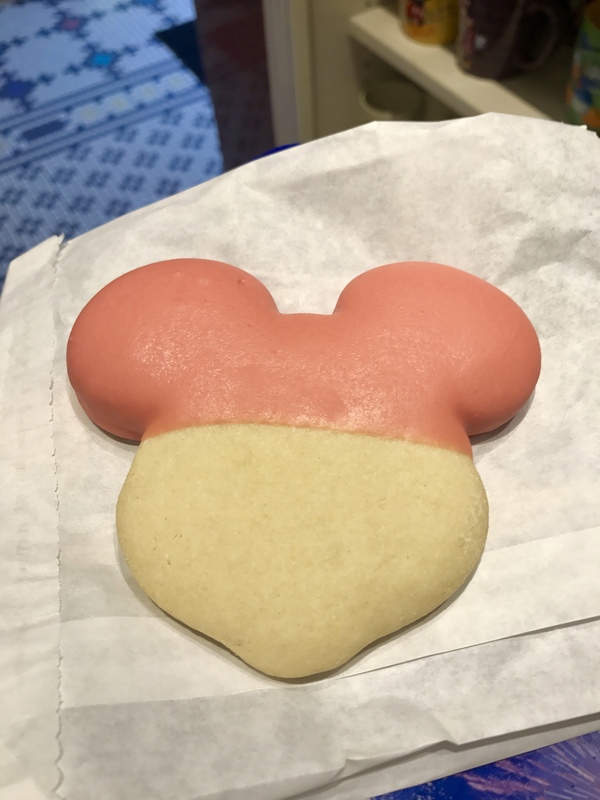 There is just something about Mickey shaped food that makes them taste so good! They sell it all around the parks at various food carts and snack locations. Pick one (or two) up for a quick snack to hold you over till your next meal. You’re welcome. This is a place that doesn’t get much attention, but actually its quite the hidden gem. They have a menu with dishes you don’t normally see at Magic Kingdom. Also, it has a whole lot of seating with great views of the park (see above pic). You wouldn’t have known by just walking into the restaurant. So, when you go there, to the left of where you order there is 1 single staircase. Head on up and choose any seat you like. Flaky Pie Crust filled with Chicken Breast and Vegetables in a Creamy Sauce, served with Steamed Fresh Vegetables. 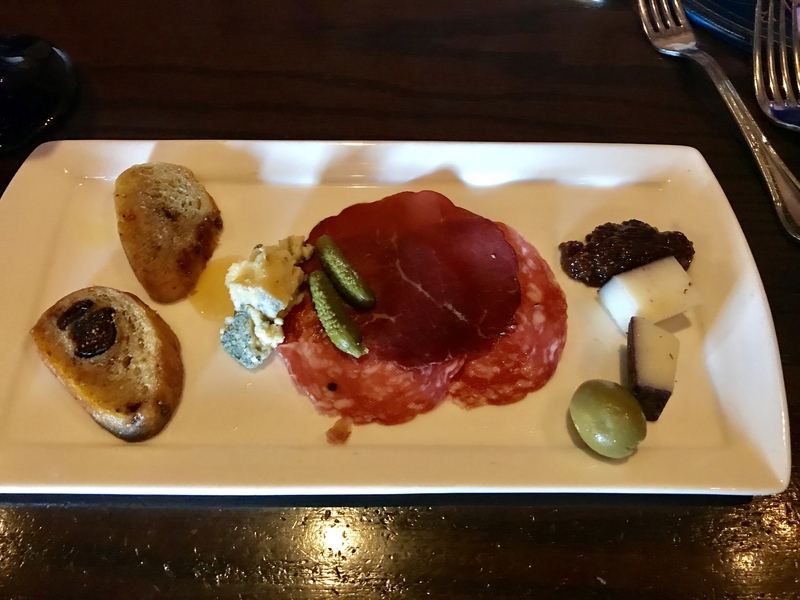 A Selection of Cured Meats, Cheese, and other specialty selections of the Castle. So unique and yummy too! 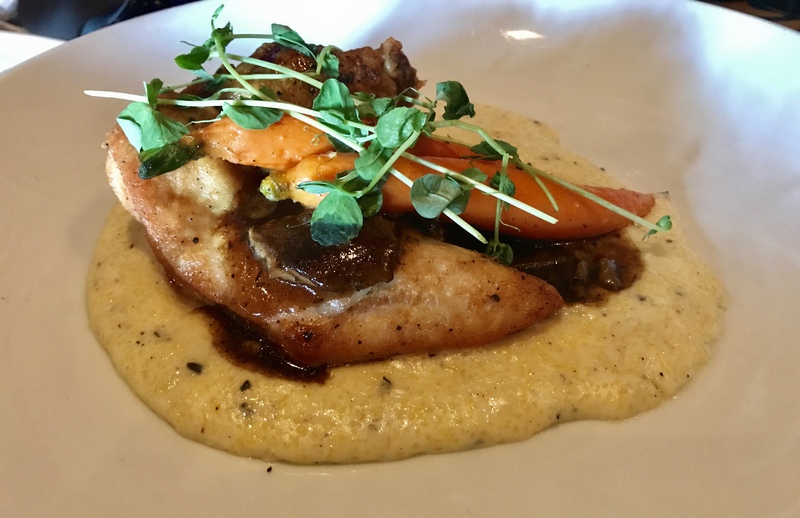 The chicken was super juicy and yummy served over creamy Goat Cheese Polenta and Baby Carrots with a Madeira Mushroom Reduction. I couldn’t believe this was lunch at an amusement park. So good. This is so delicious in it’s simplicity. I read that it was really good even though is was so simple. So I put it on my list of must try’s. And it was yummy. The ears come in other colors too. Karis got cotton candy at the same time, so I got pink to match it! P.S. Everything in this store is on my Disney Food Bucket List. Pro Tip: When you order a Candy/Carmel Apple, ask them to cut it for you (they totally do this) so it’s easier to eat! Les Halles Boulangerie & Patisserie is located in the France Pavilion at Epcot. I literally wanted to try everything they had and had to use every ounce of restraint to not order 2 things. They have both sweet and savory offerings. And Cast Members here are from that France. Which is one thing I love that Disney does. For the most part, this is also true for all the pavilions at Epcot. Now on to what I ate! This was a simple chocolate mousse that delivered goodness in every way! L’Artisan des Glaces is an artisanal French shop (also in the France Pavilion) that hand crafts ice cream and sorbet. Karis had an single scoop of ice cream and loved it! This is a little “house like” kiosk in the World showcase just before reaching the first country to the right. It’s just as it says, and it’s tossed in cinnamon sugar. This was a goodie! So these were just a few of the things we at at Walt Disney World. There is so much to taste and try you probably won’t get to everything. Secret Menu Items at Pecos Bill Tall Tale Inn & World Premier Food Court at All Star Studios Resort. How about you? What have you tried and loved? What have you tried and disliked? What should we avoid? What is a must for you? Or what are you looking forward to trying someday?